You know those days when you're thinking 'oh hey, maybe time to do the groceries again' and just as you set out for the grocery store something clicks in the back of your mind, you open the fridge one last time, pull open the veggie drawer - and there! A nice big ol' veggie staring right at you, giving you a puppy dog look at your neglectful treatment. Thankfully the veggie in question was a hearty ol' eggplant (not like those asparaguses - asparagii? - the wusses, they spoil in just a few days), and was hale enough to be cooked up into something delish. You can see it getting a little overripe, but so long as the flesh is smooth and firm, it's good to go! Also, since the bharit involves roasting and then mashing the eggplant into a smooth paste, extra-ripe eggplants are a-okay. I wanted something savory and yummy that would keep for a while (and that would taste good cold since it is summer after all). So what to do? Make a Vangyache Bharit! 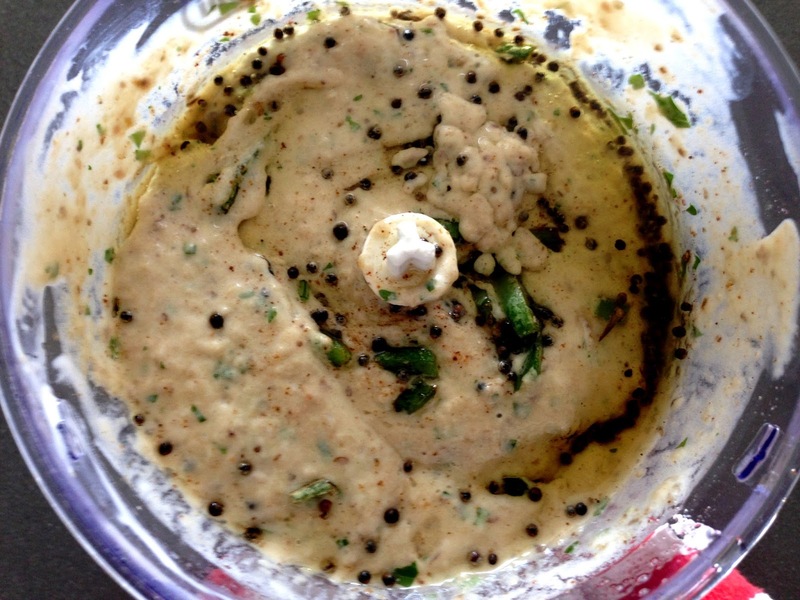 Known as Baingan Bhartha in Hindi, this is the Indian interpretation of the more widely (at least in the US) known Baba Ghanoush, and oh so delicious and savory. 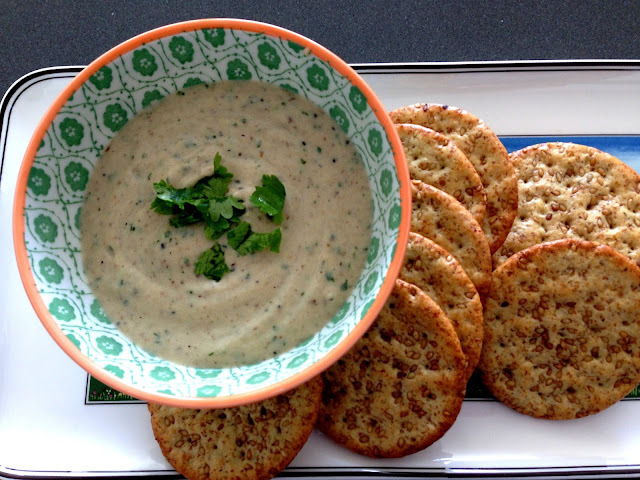 Good to eat with hot chapatis as part of a meal, or just set it out with some crackers as a dip. 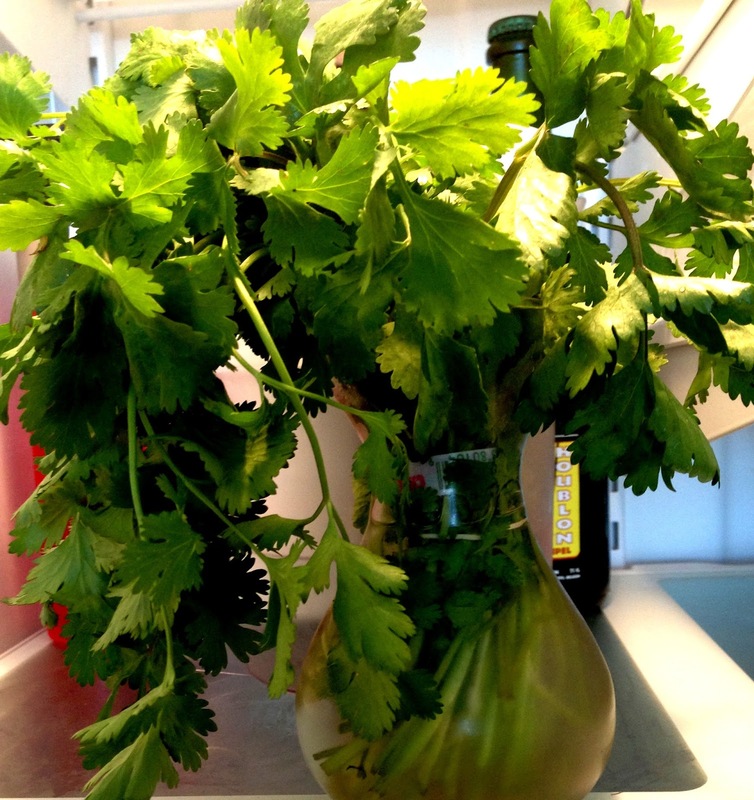 I store my cilantro in a vase in the fridge! After having too many bunches of herbs go bad on me, and after doing a bit of research, I've found this is the best way for me to keep herbs before they disintegrate into mush. The cilantro is usually covered with a plastic bag to create a nice humid atmosphere for it so it doesn't always look so pretty in there though. For roasting the eggplant, I used this technique from TheKitchn. Preheat oven to 400. 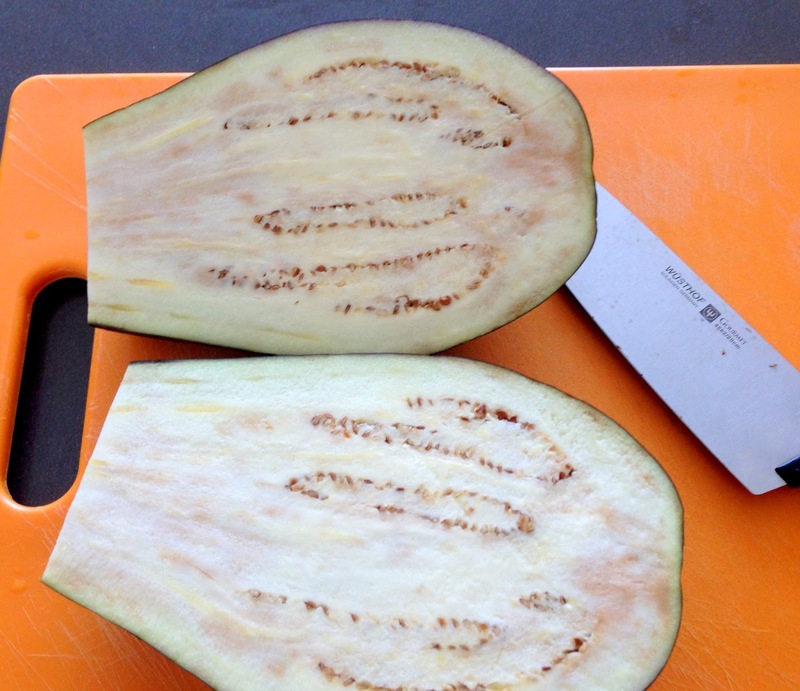 Cut the eggplant along its length, score it a little, brush with a little olive oil. Place it in an aluminum foil-lined pan and roast face down for 30-40 minutes. If you like, you can remove your eggplant after 30 minutes, and turn the broiler on. 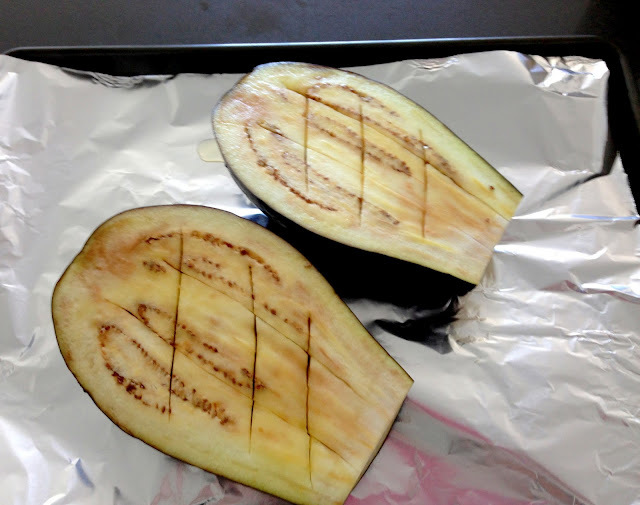 Flip the eggplant pieces so they are face up, and broil them for 2-3 minutes (about 4-5 inches away from the broiler). This will give the eggplant a nice charred, smoky flavor (which you would usually achieve by grilling the eggplant instead of roasting as I do here). Instead of going the broiler route, I decided to search out a hickory smoked sea salt that I knew I had in the back of my spice shelf somewhere. 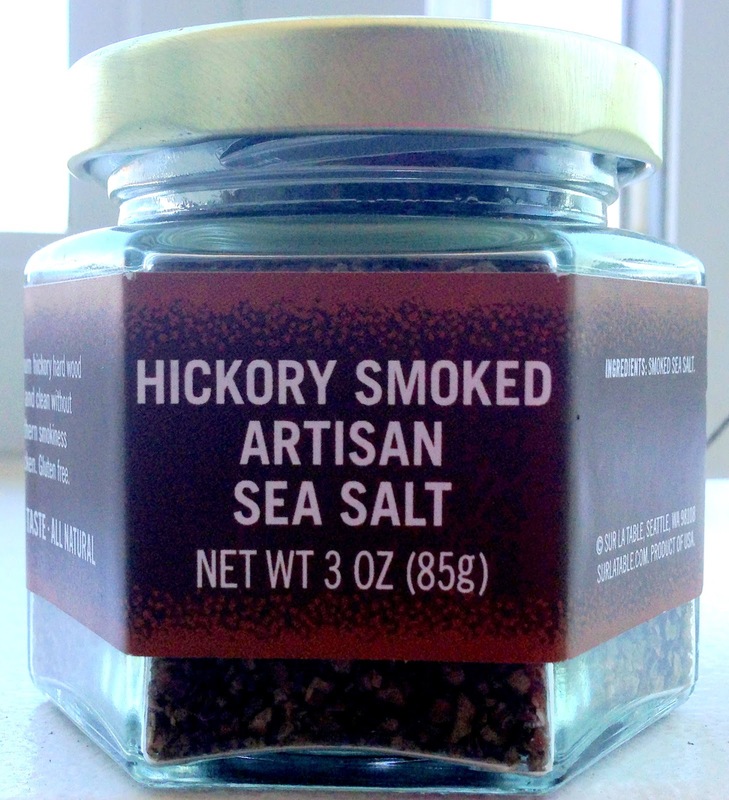 Do you have any other ideas for using a hickory smoked salt? Every now and then I'll remember it (most especially when I'm making something that would taste horrid with that kind of flavor added to it, unfortunately) and then file it away for use another day. In this it worked beautifully. But I can't only reserve it for making a smoky eggplant bharit - you use so little at a time! So if you have any ideas, leave them in the comments please! Anyway, you should broil if you're not using a smokey salt. The dish definitely needs some kind of smokiness to it. Remove from oven, let cool, then scoop out the insides. Mix with the yogurt, salt (just a little! ), sugar, cilantro, and hickory smoked salt. 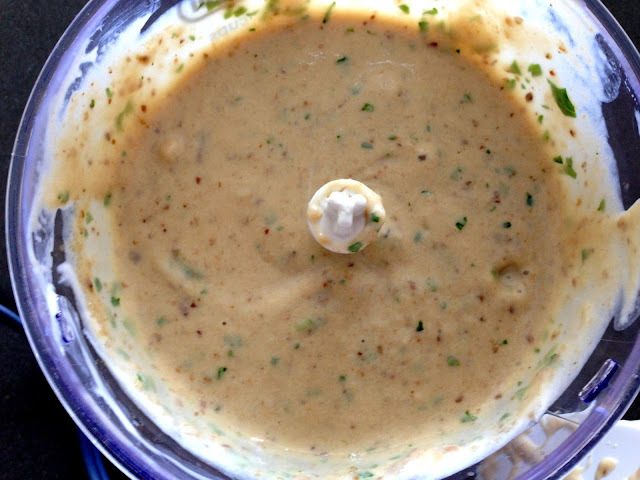 If you're using onions, this is where you would mix those in as well. You could either mash all of these together in a bowl, or, if you like your bharit to have more of a smooth creamy consistency, whirr them around in a food processor for 30 seconds. Heat 2 tbsp of oil on high. 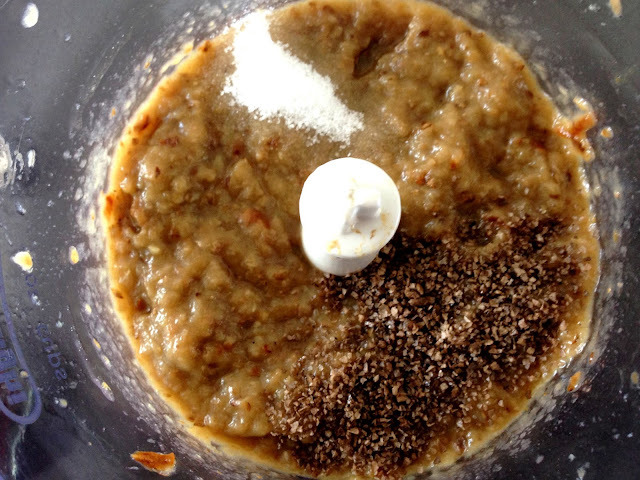 When the oil is almost smoking, add the mustard seeds. 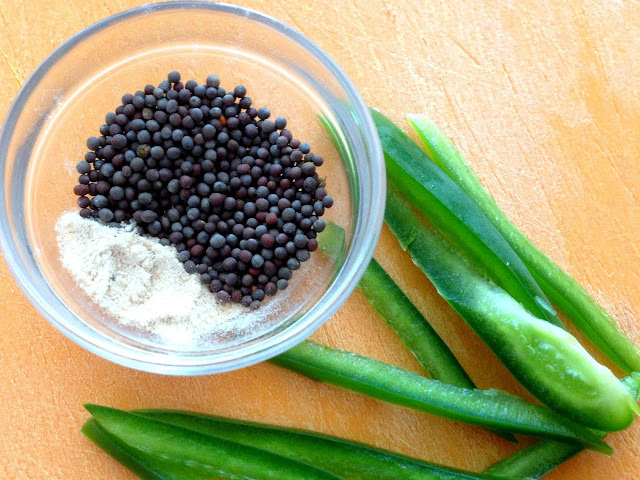 Let them splutter and bloom, add the asafoetida (and curry leaves if using) and chilies, let them splutter for 30 seconds. 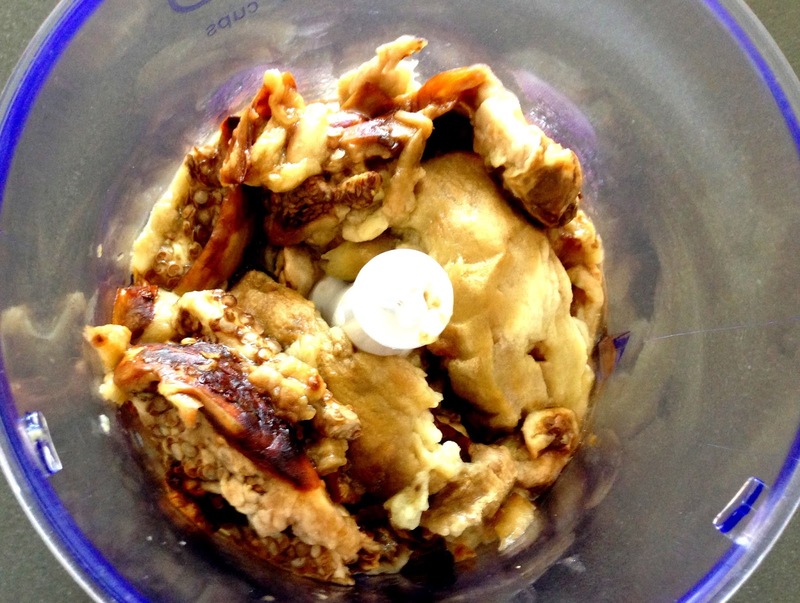 Remove from heat and immediately stir into the waiting eggplant mixture. You can wait for the mixture to cool and then give it one last go 'round in the processor if you want to not have chili bits when eating. 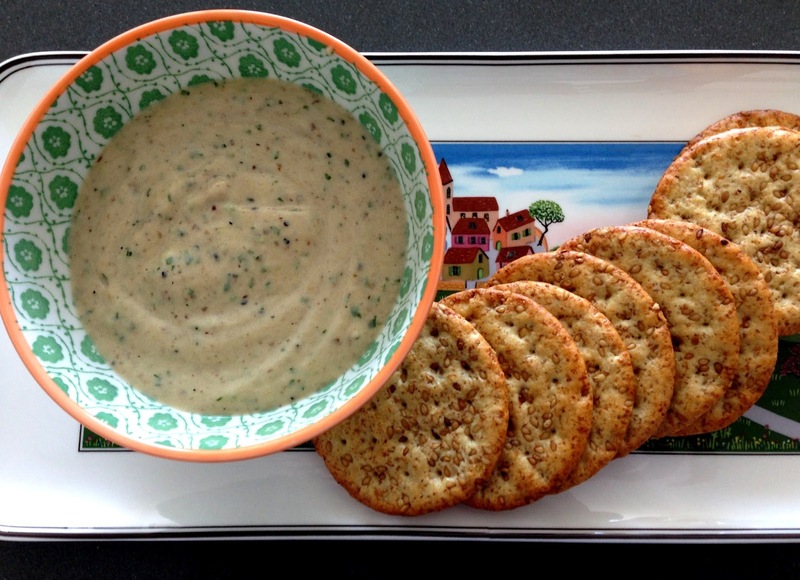 Ooh I just googled hickory sea salt cookies and found this http://joythebaker.com/2012/08/dark-chocolate-pistachio-smoked-sea-salt-cookies/ - looks yummy! Will have to try that some time.